Jamie Taylor certainly has pedigree when it comes to the world of jazz guitar. As principal lecturer at Leeds College of Music he has been involved in the tuition of musicians who have gone on to become members of Led Bib, Submotion Orchestra, Everything Everything, Roller Trio and the Bryan Ferry Orchestra. Taylor himself graduated from the college in 2000 with first class honours and went on to complete postgraduate study. He has performed with a variety of UK musicians including Adrian Ingram, Alan Barnes and Jim Mullen. Most recently he has been involved as a sideman in The Jamil Sheriff Big Band amongst other divergent projects. 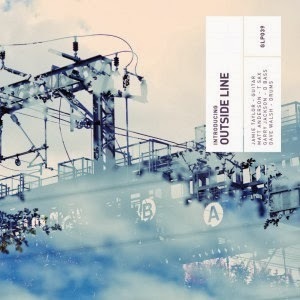 The “Outside Line” project is his latest venture and features Matt Anderson on tenor saxophone, Garry Jackson on bass and Dave Walsh on drums. Essentially “Introducing Outside Line” is broken down into two suites over six tracks, all composed by Taylor himself, the “Someone New Suite” and “Three Colours: Blues Suite”. Before a note of music is heard, the album cover artwork for this release strikes one as both industrial and organic in nature. There is an almost “scientific” feel to the imagery, which compliments the fresh production. The opening few minutes of “Someone New” are a master class in restraint as percussion and guitar roll gently around one another before the saxophone lines mournfully cut through. Here we have music that would not be out of place on a well-known Scandinavian jazz label with an evocatively austere cover. As the piece progresses the specific personalities begin to emerge however. “Fugue (Hazy)” has a gossamer thin childlike quality that is somehow baroque in its’ delivery, whilst “The Optimist” is, unsurprisingly, more upbeat and “optimistic”. The first three numbers that make up the “Someone New Suite” have a fragile charm, which makes for melancholic listening in the way that well crafted jazz can. The second suite “Three Colours: Blues” is an altogether brisker affair, which brightens the mood without losing any of its’ charisma. The music here is somehow now reminiscent of an earlier decade of jazz, and whilst not as contemporaneous sounding as the previous suite, is certainly jazz that is appropriate for the twenty first century. Maybe these tunes are more indicative of the influence on Taylor’s playing of guitarists such as Barney Kessel, whilst “Canon for Cannon” wears its’ Cannonball Adderley influences proudly. After some filthy double bass playing on the introduction “Dig Doug” is the perfect showcase for some soulful soloing from all band members and highlights their ability, over the two suites, to take on a variety of temperaments and paces. With teachers such as Taylor educating our future jazz musicians, Leeds will continue to breed a gloriously disparate cohort of musicians, that draw from any number of influences to create an exhilarating future for music in the city and further afield.